He's gone toe-to-toe with Triple H, The Undertaker, Kane and The Rock, but now WWE wrestler CM Punk (aka Phil Brooks) is stepping into an all new ring, as writer of an upcoming tale in this year's Thor Annual #1. 'The Best in the World' on one of 'Earth's Mightiest Heroes' - now that's smart! 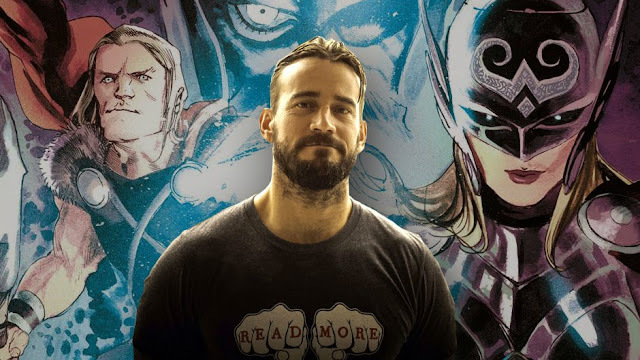 Challenged by fabled Thor writer Jason Aaron to tell a tale of 'young Thor', the former pro wrestling champ aims to have the Odinson campaign at length over beersies, why his past efforts make him worthy of wielding the sacred hammer Mjolnir. At Brooks' side, Chew artist Rob Guillory, on his first ever gig for the House of Ideas. Starting with one of Marvel's biggest stars may be an intimidating gambit for some, but in his Marvel interview, Phil reveals any step he takes is always made with another pulp icon firmly in his sights. "I think, my original pitch to Axel Alonso in 2011 was, “Let me write Punisher.” In my mind, for some odd reason, I’ve just got this Punisher story in my head, and I think it’s super, super awesome. I can read Jason Aaron’s Punisher and everybody else’s [take on the] character and it’s good, but I think that my Punisher story is pretty badass. So everything I do for Marvel is going to be leading up to, “Please just let me write my Punisher story.” So until they let me do that, you’re gonna get all kinds of other stories about all kinds of other characters until they satisfy this need I have to write Frank Castle."